Tashkent, Uzbekistan (UzDaily.com) -- In January-March 2011, the industrial output of Uzbekistan made up 8.946 trillion soums or grew by 6.2% year-on-year, the State Statistics Committee of Uzbekistan said. In the reporting period, consumer goods output reached 2.9192 billion soums (+10.3% compared to January-March 2010), of which the volume of food products made up 1.339 trillion soums (+11.5%), non-food products – 1.58 trillion soums (+9.3%). Fuel industry (18% from total industrial output), light industry (11.1%), machinery and metal processing (13.3%) and food industry (13.3%) had the largest share in the structure of industrial output of Uzbekistan in the first quarter of 2011. 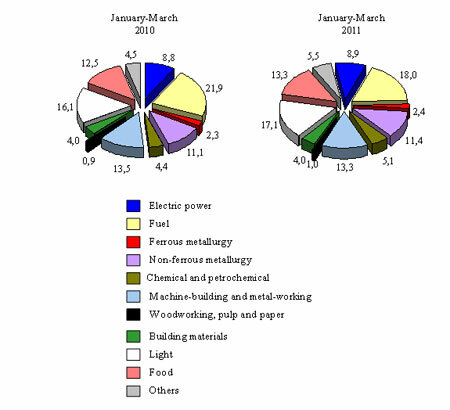 At the same time share of fuel industry in the industrial output decreased by 3.9 percentage points in January-March 2011 compared to the same period of 2010, machinery and metal processing – by 0.2 percentage points. Share of light industry rose by 1 percentage point and food industry by 0.8 percentage point.